Imagine a single vegetable that people love to hate, chances are you’re thinking of beetroot. A vegetable, childhood memories (nightmares?) are made of. I can clearly see myself sitting at the table with my grand parents in a random inn in front of a daunting and bland tasting salad accompanied by too many and overly sour pickled crinkle cut beetroot. Yuck. When I think of beetroot, really all that comes to mind is vinegar. And I know for a fact, I’m not the only one. No wonder beetroot had and still has the potential to polarize people. Naturally, I critically observed their increasing appearance on German restaurant menus and couldn’t help but regard their apparently newly gained popularity with contempt and defiance. Luckily, with most menus being substantial enough to offer plenty of alternatives, I managed to safely navigate around them. On a closer look – and with a bit of self-scrutiny – the revival of the beetroot was no longer just a fad or the obligatory trend item on a menu, people actually seemed to really like them. Just about when I was ready to give in, block out my aversion and give it another chance (beetroot light? ), it all happened sooner than I anticipated it: The company I work for threw a fancy Christmas party with a set dinner and among the appetizers, who would have thought, beetroot panna cotta in its full glory. This is the beauty of set dinners, you can’t really chicken out and order your favorite dish, so you’ll accept the situation and check it off as an experiment, of course still keeping the option to complain about it afterwards – because you didn’t order it to begin with, right?! Perhaps a perverted backup plan. An unnecessary one, I might add – the beetroot dish turned into my personal highlight that evening. I’ve been sampling different beetroot tastes since, a salad here, an appetizer there. Perhaps still with the occasional being-on -full-alert-and-ready-to-drop-everything-and-run – but with increasing enthusiasm and joy. A recent informal dinner was a true eye opener, beetroot carpaccio, thinly sliced raw beetroot with a herb vinaigrette. Raw beetroot, my new friend?! We’re still in an early phase of a relationship, I simply love to consume his presence, pun intended. And since its health benefits come with the package, there is no reason to slow down. I just need to stay clear from those old school canned… Anyway, my favorite raw vegetable salad (turnip cabbage, apples, carrots) received an upgrade: The beetroot’s earthy flavor makes a fantastic combination with the apples, probably the best way to convince other beetroot haters of its delicious qualities. Craving fresh and healthy food? Don’t look further. 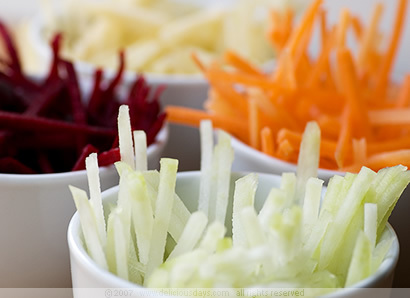 Out of convenience or for neat looks use a slicer of your choice or simply manually cut the veggies and the apple in more or less equally thin sticks (about 2-3mm thick). This is a great opportunity to dust of advanced kitchen tools that usually don’t get so much attention, like the Kitchen Aid slicer add-on or the mighty Mandoline. Alternatively to slicing, you could also try grating the vegetables/apple, which of course will result in a different and less crunchy consistency – but will taste great nevertheless. Note: Be careful when dealing with fresh cut beetroot – its stains are a true nightmare and virtually impossible to remove! Pile the fruit and vegetable sticks in a large bowl, add the yogurt, olive oil, coarse sea salt, lime juice and blend carefully. For enhanced flavors, allow the mix to rest in the fridge for half an hour (cover up with cling foil). Add some more seasoning if necessary & serve in small bowls. Just before serving, sprinkle with crumbled sheeps’ cheese and top with lime zest. Since I re-discovered beetroots once I've seen one of my favourite German-TV-present-cooks, Johann Lafer, baking them in aceto balsamico with some herbs and garlic even my husband who initially hated beetroots felt in love with them. I prefer those cute little baby beetroots and prepare them with their peel. I am a confirmed beet hater--I've always thought they tasted like metal (perhaps because they came from a can). But if you can get over your distaste, I'll have to trust you and try this recipe--I must admit, it does sound very refreshing (not to mention tempting)! Are what I've always called beets the same thing as beetroots? I'd love to try this recipe and become a fan of the beautiful veggie. If I even think about vinegar in the vicinity of vegetables, my 10 year old is on full anti-vinegar alert! But I, too, am recently taken with beets... I will certainly try this version of beetroot. And similarly, will take and dust off my kitchen aid attachment (KAA); it is so funny to me how little my KAAs are used. New Year Resolution, perhaps? Is it just me, or is a mikado strikingly reminiscent of a celery root remoulade? I don't share your aversion to beets, nor does my wife, so we'll have to add this to our list of dishes to try. I'm also intrigued by the use of raw beet. That is a foreign concept to me. Very inspiring, thanks! Beetroot can be really nice as long as you stay clear of the typical German pickled variety. But fresh beetroot and carrot juice at Viktualienmarkt? Like a bite of garden bed. I finally found out how wonderful and versatile beetroot is during my two week holiday in Poland last year, and have been a fan ever since. This has to be the most colorful salad I have seen in ages! You just made me add beetroot to my virtual shopping list. Maybe I could learn to like it,too? Beetroot makes a regular appearance in our kitchen - last Saturday in the form of very nice beetroot & blue cheese risotto :) It must be a culture thing - various beetroot salads ("the fur coat", rosolye) are popular in Estonia, as are beetroot soups (most famously bortsch, but also cold okroshka-type soups). But I agree - vinegar-pickled beetroot slices are vile! Oh je! Diese labbrigen sauren rote Beete haben auch bei mir ein Trauma ausgelöst, ich hab sie tatsächlich nie wieder angefasst! Roh klingt da schon besser, vielleicht geht das geschmacklich dann in Richtung Möhren knabbern? Nicki - love the site (& the design is gorgeous). I just adore beetroots so keep the recipes coming. 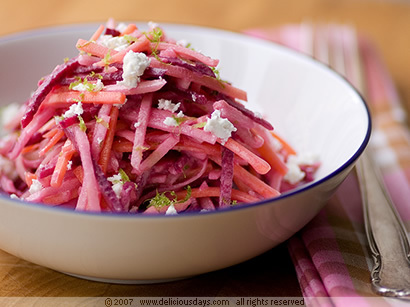 I love nibbling on turnip cabbage and carrot sticks while working, this salad is made for me!! I might be the exception but I have always loved beetroots, from being cooked to raw, pickled or preserved to fresh. I then do not need convincing that I would love this salad! I don't know if you have this product in Germany, but my mother has found that clearning your hands with Polident denture cleaners will pretty much get rid of any stain (i.e. Easter egg dye, food stains). Hope this helps in making your adventures with beets & other foods much more enjoyable. I fell in love with beetroot this year (the first time I tried it, being Chinese and all) but I've been slowing down a bit since Christmas... this recipe makes me start up again! I like serving sliced roasted beetroot with balsamic vinegar, feta and nuts. What a treat! My boyfriend's family is Russian and I always tease him that beets are in his blood. They happen to be one of my favorite ways to sweeten up a salad. I am also a big fan of a Russian dish (I don't know the name in Russian, so I call it "Purple Fish") that is a salad of white fish, shredded beets and mayonnaise. Ok, it doesn't sound so appetizing like that, but it's delicious! I'm no pro cooker, but I know beetroot can be very good just in salads, so I might have to try out this one just because of that! BTW: Congratulate from a fellow 9ruler, for making it as a finalist in the 2007 bloggies award. I voted for you! You've earned it. You have a very delicious blog here with not only delicious recipes, but also delicious looking photos to go with them! All together it gives a very professional feeling. Beetroot carpaccio is great - I recently had it a dinner party, topped with tuna tartar. An unlikely combination but it worked so well! Btw, I'm just making bagels according to your recipe as I'm typing this! I love raw vegetable salads although I have to admit I never ate beetroot. No bad memories on my end, somehow I never came across a tempting dish. Will look out for some to try this salad! Beautiful pictures. This salad sounds great! I hated beets as a kid too and only recently fell in love with them! Great minds must think alike; beetroot has been on my table (and my blog) recently, too. My wife is Polish, so there's no getting away from the fact. Like it or loathe it, beetroot plays a major part in our cooking. Incidentally, I wholeheartedly agree - pickled beetroot is enough to put anybody off, and for some reason seems to be the only way that most (British) people eat it. Roasted beets are wonderful in salads. My husband had the typical german aversion until he lived in the states and I came home with those lovely golden and chioggia varieties from the farmer's market. (He didn't realize they were beets until after they were long gone...ha!) I haven't seen those in Germany, unfortunately. Maybe now there will be more demand. Wow! the salad colours and julienned shapes are so so delightful. And the machine with the beetroot colour - that is warning enough. is that a printer? And did the prints come out in beetrooted papers :)? The recipe is truly inviting. As long as you don't cut your skin. Pickled beetroot, thank you for reminding me of the worst food memories of my childhood! Reading the praise above, I might be willing to give the raw ones a chance though. Maybe. Die Packung vorsichtig, ohne zu Schütteln, öffnen. Das dünnflüssige Kokoswasser von der dicken weißen Creme trennen. Aus Limettensaft, Ahornsirup und Walnussöl eine Sauce rühren, mit Salz und Pfeffer würzen, 3 EL Kokoswasser untermischen. Mango, Möhren und Rote Bete schälen und auf einer Juliennereibe in feinste Streifen hobeln. Mit der Sauce begießen, ab und zu mischen. Von dem frischen Kokosfleisch die braune Haut abschälen, mit dem Sparschäler dünne Streifen abziehen. Korianderblättchen hacken. Dicke Kokossahne mit Cayenne, Zimt und etwas Salz mischen. Den Salat anrichten: Auf jede Portion einen Klecks Kokossahne geben, mit Koriandergrün bestreuen, mit Kokos-Chips dekorieren. I love beetroot in a salad like this, without the cheese even, just beets, braised in water with salt, a sprig of thyme, a little olive oil and maybe a bay leaf and a peppercorn til soft., then cut in the same way, and drizzled with more of the most beautiful olive oil you can fine, a squeeze of lemon, and some fresh mint and fresh chive. Your photographs are inspirational and lovely. You have done well to rediscover beetroot as a prior beetroot hater. Big suggestion is that if there is a vege to avoid instead it is brusssels sprouts! If anyone has a way to serve them that I can actually eat I will be suprised! wow, that's awesome. in fact, this is my first time here and your blog's mind-blowing. will be back for more. I don't have aversions against beetroot concerning their taste but concerning their color. Being some clumsy fellow in the kitchen, I'm continuously having issues with their persistant red stains. My wooden chopping board looks like I killed something! I too am a beet hater...but silly question, is beet & beetroot the same thing, or something else? Growing up on the border of Austria to Hungary pickled beetroots were often a standard on the „mixed salad”, a side dish they serve on a glass saucer neatly crowded with badges of salads with substance like potaotoes, beans (the yellow ones, „Wachsbohnen”), cucumber, carrots, pearl onions. I ate everything including the beetroot, even when it was out of a supermarketglass. On the other hand I doubted for a long time, that fancy chefs discovered beetroot because its colour is a perfect make up for a creamy soup (of course always combined with the whites of horseraddish). And I was missing the sour „yuck” that was the real beetroot taste for me. But now I am in: pure beetroot, just baked in its skin under a cover of foil or even salt (like the fish), great! And your salad is next. May I add some fish sauce (yuckyuck) and cane sugar (but skipping the oil ), a combination I met in Australia which is a beetrootlover’s dorado? What wonders a madoline can create! This looks amazing! I love beets. It is certainly a refreshing salad. My impression on beetroot has always been a nice one - sweet, juicy and cooling. Of course it's not the pickled ones. Did tried pickling it once and it wasn't what I quite expected. So, no to pickled beetroot. Brigitte, I will look out for some baby beetroots and try it the "Lafer" way. Since the venison recipe turned out beautifully, I'm have become a big fan recipes! Janelle, I so hear you! Got to have them, but then you end up using them quite rarely... I think my KitchenAid attachments (ok, only three I might add) are the least used tools in our kitchen (perhaps because of the mandoline...). Pille, Your risotto sounds so extravagant! While I love to make radicchio-red wine-risotto, mine was not nearly as colorful red as yours! Wow! Mrs Lifecruiser, Thanks you for the nice feedback! Let me assure you, there's absolutely no need to be a pro cook for this salad, so simple, so rewarding. Liebe Bettina, Du weißt ja, dass ich Deinen Rezepten blind vertraue, oder? Die nächste Mango die mir unter die Augen kommt ist fällig! David, Michelle, I would use both terms analogously, so do various online sources. Sebastian, Feel free to add or experiment with whatever you think makes sense, Australian memories? Excellent! However, I second the yuckyuck part, at least as very first reaction to it ;) But maybe you can tempt me with the baked version. I made this combo of veggies and fruit but I actually forgot to buy carrots, somehow. So just beets, turnips and granny smiths in the indicated proportions. Anyway, I dressed it in a mix of raspberry yogurt, herbed whole grain mustard, cider vinegar and S&P - so good.... I am obsessed now. What is a turnip cabbage? I googled and it and couldn't find it. What a nice combo, tried it last week. Also I had to leave out turnip cabbage (my daugther dislikes it), it was very refreshing and yummy. Theresa, Glad it turned out well. There is really no absolute way of making this salad and I'm always happy to hear about other substitute ingredients! Ah - turnip cabbage = kohlrabi! Another underappreciated vegetable here in the USA. I love beetroot. Here's an east indian recipe.